Every day, it seems, another team in another sport is begging local government to pay for its stupid stadium upgrades—luxury boxes, video boards, home-run whirligigs. And seemingly every other day, more or less, municipalities give into the bullying. Lee County commissioners Monday told staff to continue talks with the Washington Nationals, even though county coffers can't afford to meet the team's demands. The Nationals want $36.6 million in upgrades to City of Palms Park and new training facilities, before they relocate their springtime home from Brevard County. About the Nationals' current home: It's Space Coast Stadium in Viera, Fla., which was built in 1994 to keep the Marlins' spring games in-state. It remained the Marlins' home until Jeffrey Loria swapped the Expos for the Marlins in 2002, when Loria decided he'd keep Montreal's newer spring digs at Jupiter's Roger Dean Stadium, which opened in 1998. Loria happily forced the older stadium on Montreal's new owners, MLB. Love that guy. In any event, the Nationals' home isn't yet 20 years old. But they're still itching for a new one. For spring freaking training. So why is it that Lee County won't give in to the Nats? Have they finally gotten some sense about the economic ineffectiveness of publicly subsidized stadiums? Are they going to invest in infrastructure? Or schools? Lee County, however, can't afford anything close to that amount after taking on about $234 million in baseball-related debt over the past several years—borrowing $143 million to build a new stadium for the Red Sox and agreeing to take on another $91 million loan for improvements the Minnesota Twins want. And Ken Belson's story in The New York Times explains that Lee County is no outlier. St. Lucie County, which owns the Mets' stadium (now again named Tradition Field, after the last naming-rights holders, fittingly, went bankrupt), spent $2.5 million last year to add space for a second clubhouse to the stadium. (Not an actual second clubhouse. Space for one. A big basement. The clubhouse would cost much more.) They want a co-tenant. But the county can't find another team to share space with the Mets. Why? The trouble is that the Mets and St. Lucie County have competition from other cities in Florida and Arizona that also want to attract teams, and that gives the Nationals and the Astros leverage. To keep teams from leaving, Gov. 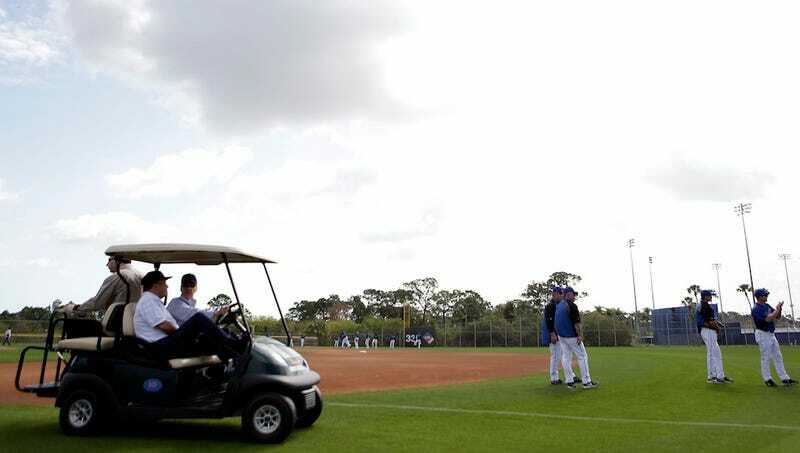 Rick Scott announced last week that he would ask the Florida legislature for $5 million a year to improve Major League Baseball facilities in the state. $2.5 million isn't a lot, as far as big business goes, and neither is $5 million. But those numbers represent the baseline, not the ceiling. A little negotiating, and counties wind up with bills that look a lot more like $143 million and $91 million, numbers big enough to crush the specious economic impact analysis involved in any stadium-financing project. The hustle shouldn't even work, anyway. With big-league stadiums, teams can plausibly pretend to need new event technology to catch up. All the other stadiums have underground cocktail lounges! But with spring training games, fans are content, literally, to plop themselves down on the outfield grass. All they want is baseball and warm weather, the same old things they've found in Florida, every March, for more than 100 years.